UGLARworks painting a mural on S. Western Ave. and W. 2nd St. as part of their 2012 Public Works billboard project. Photo courtesy of UGLARworks. Murals are hard to miss in Los Angeles. From the larger-than-life orchestra players who loom over the Harbor Freeway to the paintings on the side of your local store, they’re woven into so many parts of our landscape. Artists Chris “Horishiki” Brand, Espi, and Evan Skrederstu—who all contributed to JANM’s Perseverance: Japanese Tattoo Tradition in a Modern World exhibition—started collaborating on art in the early 2000s as members of UGLAR (Unified Group of Los Angeles Residents). Altogether, the group comprises six local artists: Skrederstu, Brand, Espi, Steve Martinez, Jose A. Lopez, and Ryan Gattis. Later, their name was changed to UGLARworks as a nod to the Works Progress Administration, which supported the creation of many of the great public murals of LA. UGLARworks’ art can be seen throughout the city, whether on billboards or in the galleries of the Wende Museum. They’ve been honored by the Mural Conservancy of Los Angeles and reviewed in the Los Angeles Times. The members of UGLARworks consider themselves storytellers as well as artists. In 2008, they created The Ulysses Guide to the Los Angeles River (the original source of the acronym UGLAR), a book that showcases the wildlife and art of the iconic LA River. Narrated by the fictional Angeleno character Ulysses L. Zemanova, the dense book includes stories, interviews, and artwork. With the addition of writer and visual artist Gattis in 2012, UGLARworks now focuses on creating constantly unfolding narratives in their art that reflect their urban environment. Come watch Brand, Espi, and Skrederstu paint a new artwork live at JANM’s Natsumatsuri Family Festival on Saturday, August 9, 2014 from 1 p.m. to 2 p.m. The UGLARworks members will also sign copies of the Perseverance catalogue following the painting. Women tie their omikuji to the wire rack at a Japanese shrine. Photo: Jesslee Cuizon (jessleecuizon.com) via Flickr. Omikuji are Japanese paper fortunes found at shrines across Japan. Traditionally, you shake a cylinder until a numbered bamboo stick falls out. The number on the stick corresponds with a paper fortune, which is then given to you by the priest or shrine maiden. Today, many shrines have boxes that allow you to randomly select a fortune yourself. If your fortune is good, the custom is to keep the paper slip close to you, like in a purse or wallet. If it’s bad, many fold up the strip and tie it to a pine tree or rack of metal wires that is provided at shrines. Traditionally, a pine branch is used because the Japanese word for “pine” (matsu) is phonetically the same as the verb for “to wait,” although written in different characters (kanji). The hope is that the bad luck will wait by the tree instead of coming back home with you. JANM volunteers hand out omikuji at the 2013 Natsumatsuri Family Festival. Photo: Tokumasa Shoji. You can get an omikuji any time, although many people specifically include it in Hatsumode (the first Shinto shrine visit of the Japanese new year) or seek it out before major life events like exams. Omikuji are not commonly found in the United States outside of Japanese enclaves. However, you’ve probably seen what some say is its modern-day incarnation—the fortune cookie! Whether you have an important decision coming up, or are just looking for a little guidance, an omikuji opportunity is coming soon. 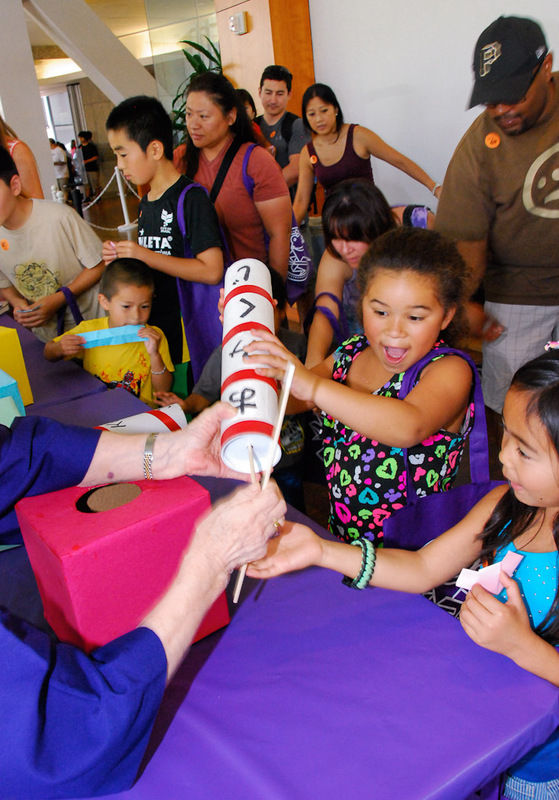 Visit the omikuji table at JANM’s free Natsumatsuri Family Festival on Saturday, August 9, 2014 and see what’s in store for you! Save the Date: Go for Broke! 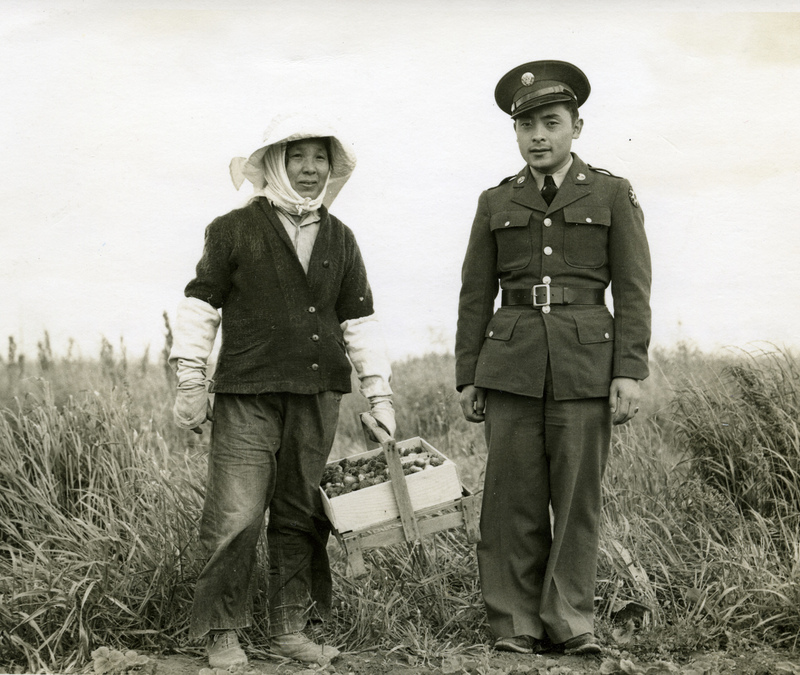 Young Nisei soldier who entered the Army before the war and his mother pose in their strawberry field in Northern California shortly before incarceration. 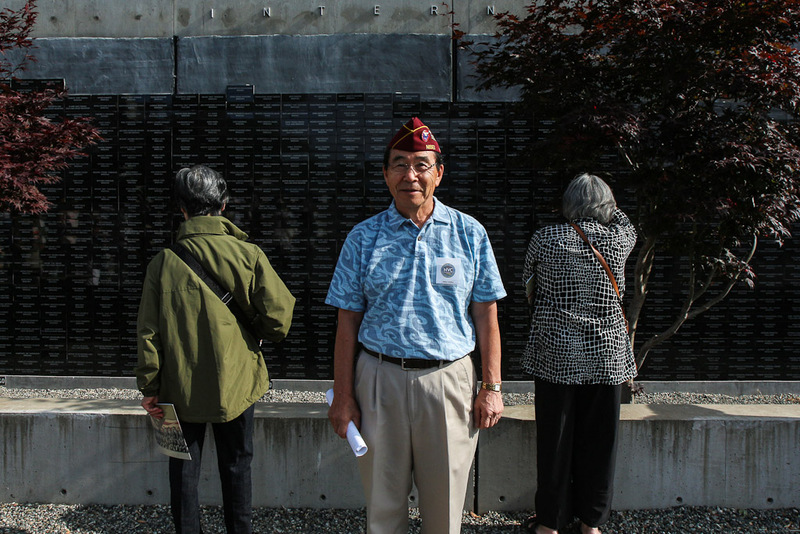 The Nisei soldiers who fought in World War II embodied a particular set of values, passed down from generation to generation. Giri—sense of duty. Gambare—perseverance. And of course, go for broke—give it your all. 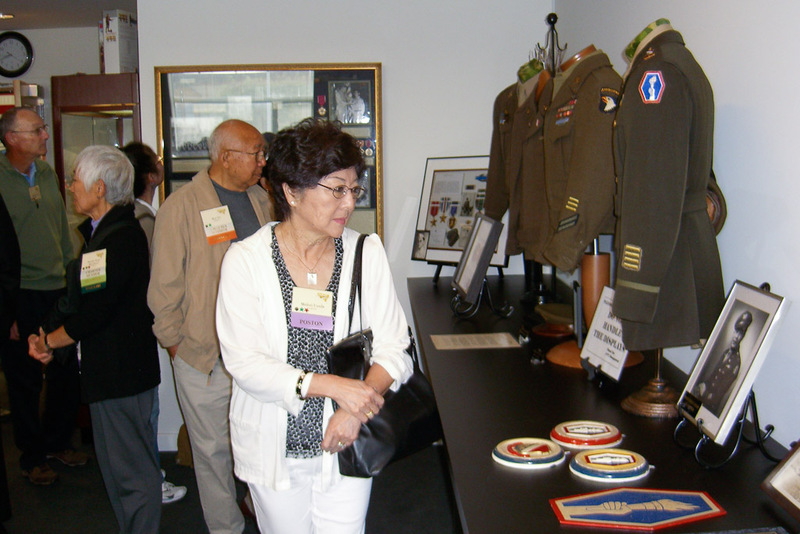 When Go for Broke: Japanese American Soldiers Fighting on Two Fronts opens on November 12, 2014, look deeper into the lives of these Nisei who gave their all. Go For Broke chronicles the resilience and bravery of these young men both on and off the battlefield. Japanese American soldiers fought in eight brutal campaigns across Europe, receiving thousands of medals for heroism even while suffering an astronomical casualty rate. Thousands more joined the Military Intelligence Service and operated throughout the Pacific Theater as language and intelligence specialists. Yet their battles were not finished when the war ended. The Nisei veterans returned to fight pervasive racism back home—and proved just as successful in this arena. With their help, hundreds of anti-Asian laws were struck down. First displayed at the Ellis Island Immigration Museum in New York, Go For Broke shows how instrumental these soldiers were in the Japanese American fight for justice both overseas and at home. 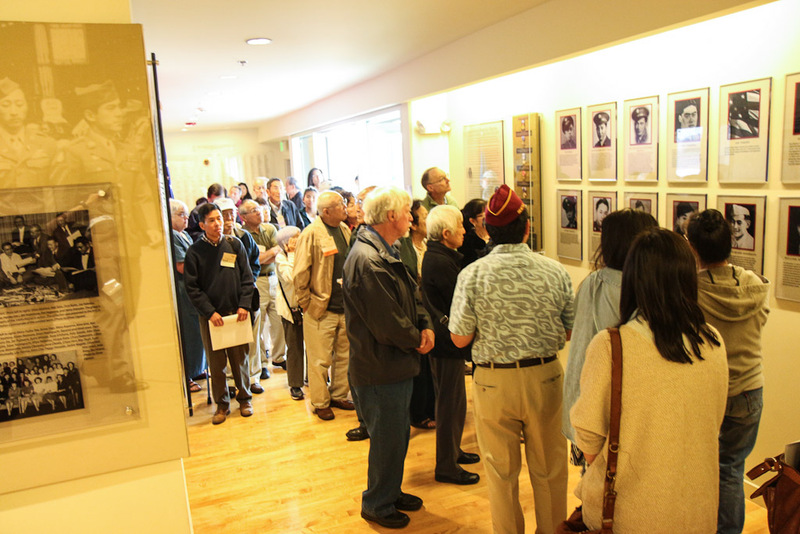 The photographs in this exhibition are supplemented by a special Guide by Cell audio tour, with narration by curator Eric Saul and Nisei veterans. To celebrate the opening of this exhibition, we invite all JANM Members for a special preview of the exhibition before it opens to the public. Members are invited to join us for an exclusive preview of Go For Broke with curator Eric Saul. To RSVP, contact specialevents@janm.org or 213.625-0414 ext. 2222 by Wednesday, November 6. M.I.S. veterans, Edwin Nakasone, Bruce Kaji, and Hitoshi Sameshima, will discuss their roles in the rebuilding of Japan after the end of World War II. The MIS was a US military unit mostly comprised of Japanese American Nisei who provided translation, interpretation, and interrogation services during World War II. Presented as part of the Tateuchi Public Program Series. 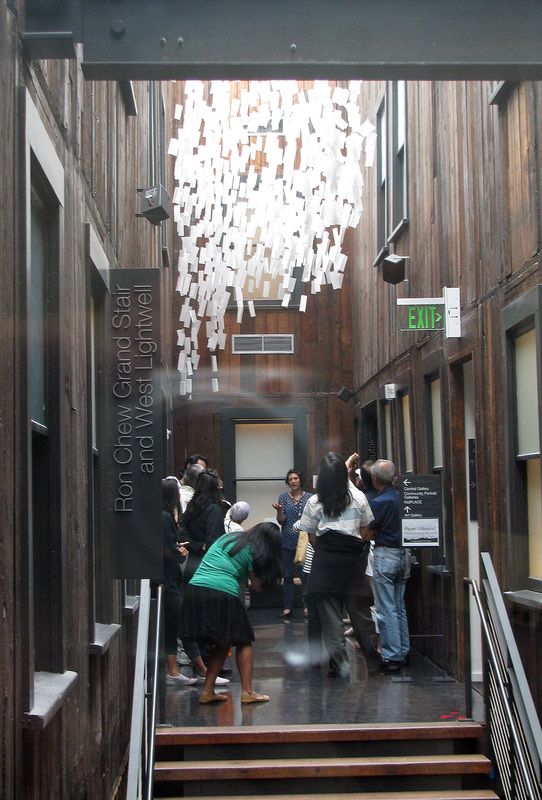 Visitors pause in front of the George Tsutakawa Art Gallery at the Wing Luke Museum of the Asian Pacific American Experience. More photos from our 2013 National Conference in Seattle! 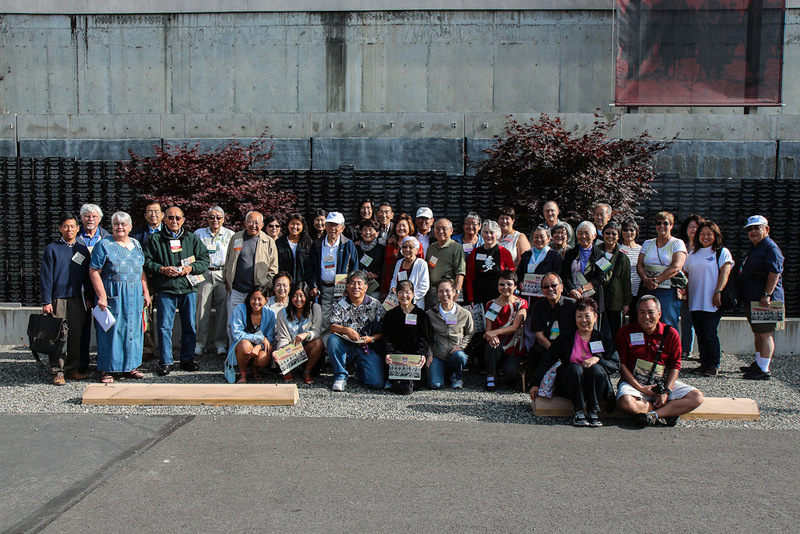 Our guests at the National Conference got to learn about Japanese American history both in and out of the Sheraton through two tours of Seattle! 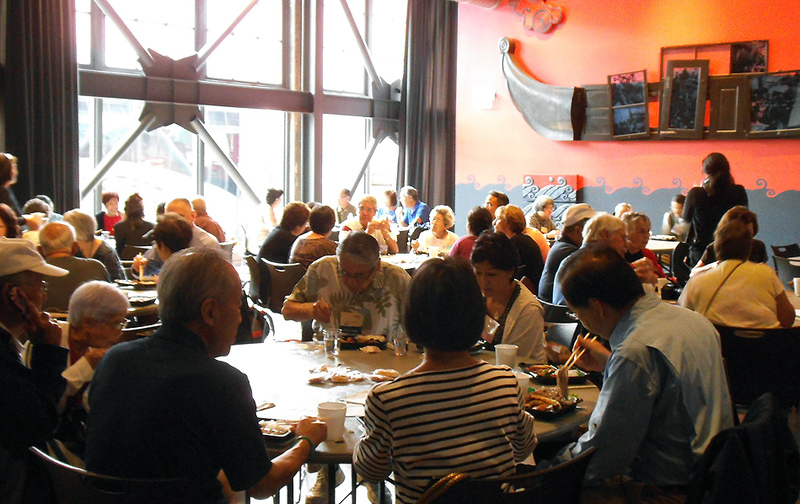 Tour-goers explored prominent landmarks, including the Wing Luke Museum of the Asian Pacific American Experience and the Panama Hotel. 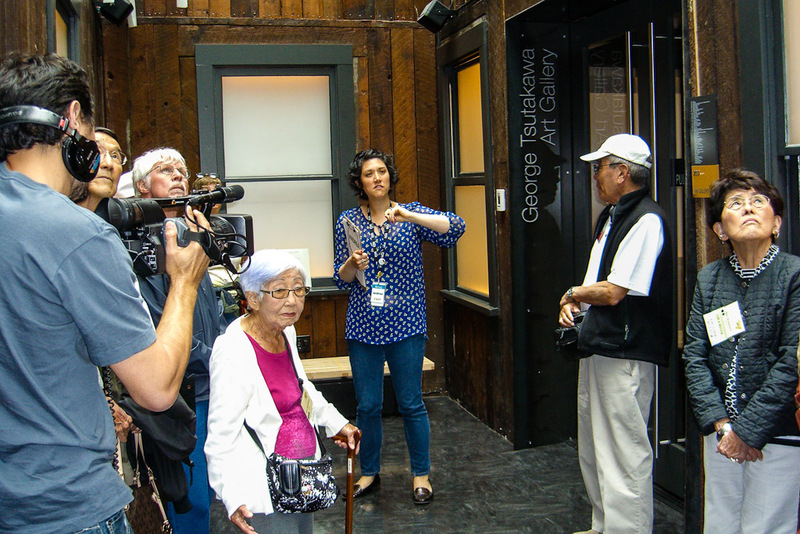 In the International District bus tour, we were able to visit where the pioneers of the neighborhood lived and learned about the lives of the area’s first Chinese, Japanese, and Filipino immigrants and laborers. 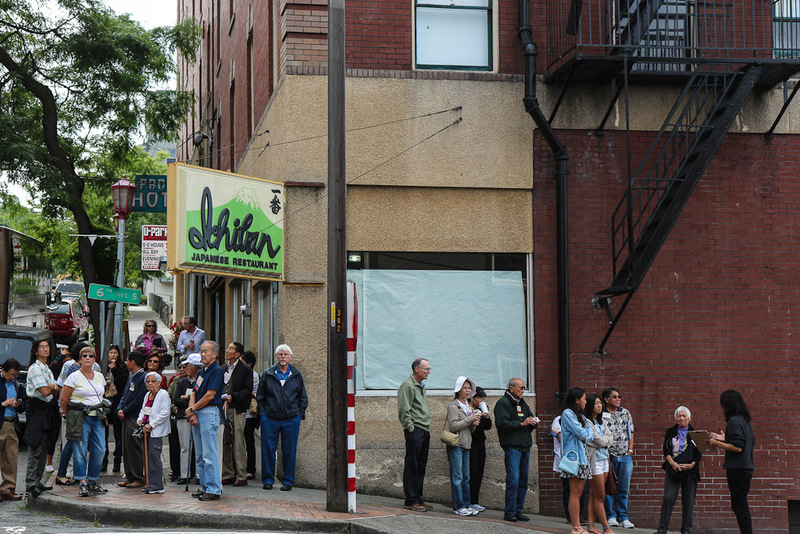 The second tour, of Seattle’s Nihonmachi, walked through the historic sites of Seattle’s Japantown. 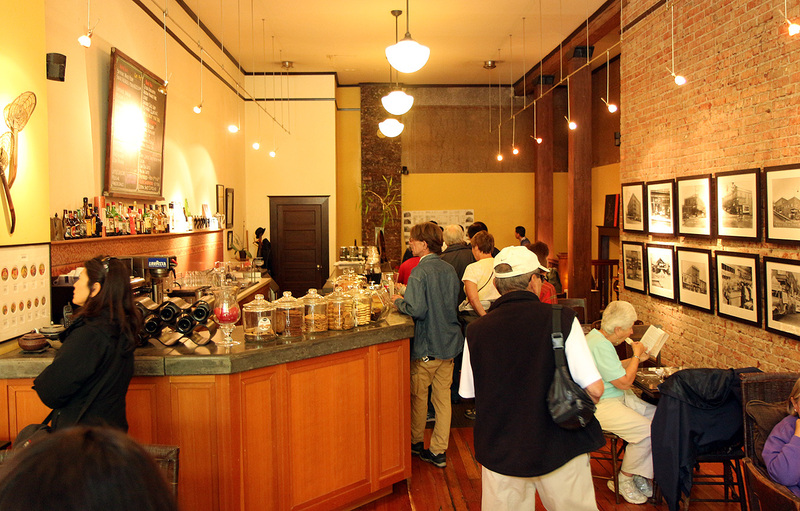 The tour introduced early life in Japantown and includes visits to the Panama Hotel, Kobo at Higo Store, Nippon Kan Theater, and Kobe Terrace Park. Both ended at the Wing Luke Museum. Check out more photos from the Conference in our previous blog posts or on our Facebook page. Photos by: Bob Moriguchi, June Aoki, Midori Uyeda, and Richard Murakami. This summer we were lucky enough to host Sean Hamamoto, our second Nikkei Community Intern in collaboration with the Japanese American Bar Association (JABA)! We had a great time getting to know Sean, a rising sophomore Politics major at the University of Pennsylvania. 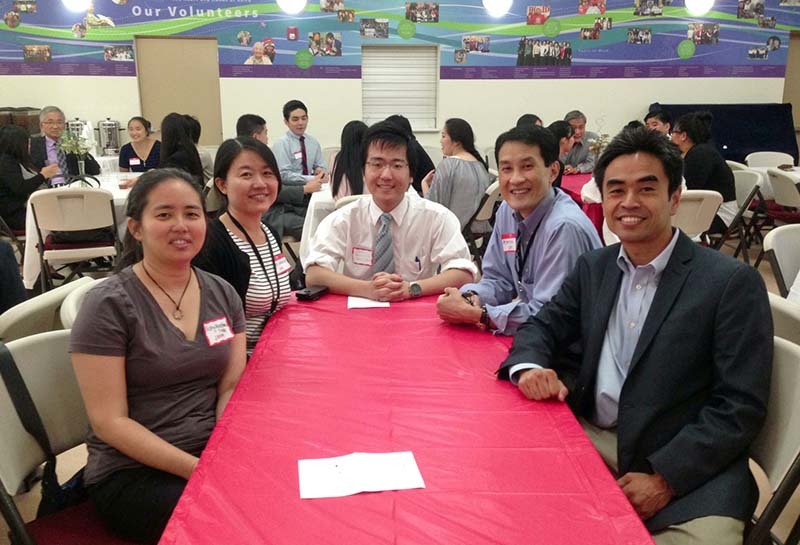 The Nikkei Community Internship is an eight-week program that places college students at various Japanese American organizations across California. Interns get a taste of working life at their placements for four days of the week, then spend the remaining day on leadership development and community training. For the internship, JANM shared an intern with JABA to work on joint Discover Nikkei projects. With JABA, Sean worked on the Legacy Project: Legal Legends in the Nikkei Community, which seeks to record profiles of Japanese American legal leaders. He interviewed Los Angeles County Alternate Public Defender Janice Fukai and attorney/civil rights activist Rose Ochi about their life and work. In addition to these profiles, Sean got to put his Japanese skills to good use at JABA’s free legal clinic, where he registered clients. You can read Sean’s reflection of his eight weeks with JANM and JABA here. 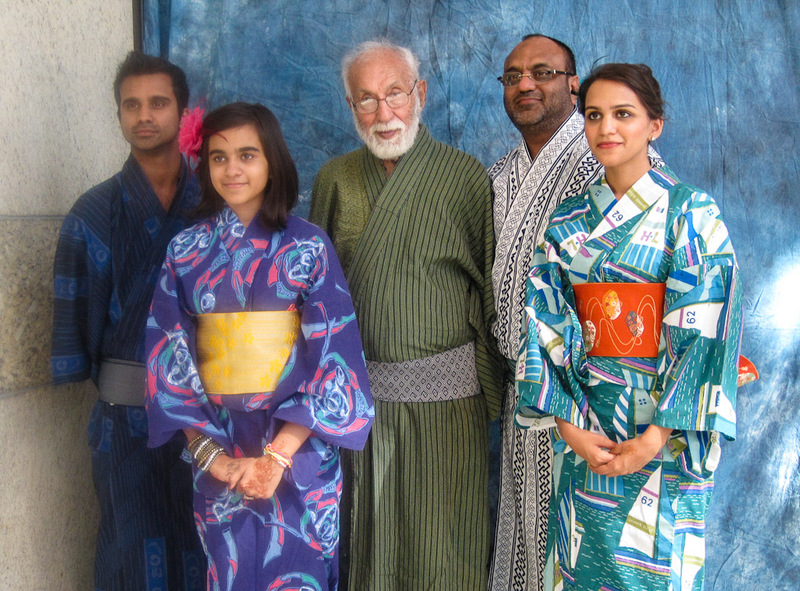 Sean’s passions for law and Japanese culture were huge assets to both his work at JANM and JABA. We hope he’ll remain a frequent visitor to JANM! Join us every Saturday at 1 p.m. for Our American Voice, a two-person show exploring six diverse stories of Asian Pacific Americans, held every Saturday at 1pm in the gallery. Created in partnership with East West Players for our new exhibition I Want the Wide American Earth: An Asian Pacific American Story, the performance is directed by Jennifer Chang and features Traci Kato-Kiriyama and Johnny Kwon in the six pieces written by D’Lo, Vivian Keh-Hue, Giovanni Ortega, Jeanne Sakata and Ova Saopeng, and Judy Soo Hoo. Each piece is a slice in the life of an Asian Pacific American. Overall, they come together to form a larger picture representing the worlds of vastly different people, spanning decades and ethnicities, but ultimately united by their experience of being Asian in America. Don’t miss out on the opportunity to see the work of talented writers and actors come alive in an intimate setting! Katherine Cheung defied family tradition and crossed racial lines to become the first licensed Asian American female aviator in 1932. During the 1930s, Cheung barnstormed across California, and her fame as a stunt pilot led to an invitation to join Amelia Earhart’s Ninety-Nines, an all-female flying club. Lao-American siblings Soukki and Joy, refugees from the Vietnam War Era, must confront each other about a return trip to their homeland of Laos. How will they reconnect with a homeland that has long been forgotten and is so far away? When young ALLOS arrives in the United States we witness his journey to find employment as well as acceptance amid the hardships of the Great Depression and bigotry of our past. An immigrant Sri Lankan nurse shares her conclusions on love and loneliness in America. At Seattle’s University of Washington during WWII, following the bombing of Pearl Harbor, a curfew is announced for all people of Japanese ancestry requiring them to be in their homes by 8PM. Gordon Hirabayashi, a Nisei student at the University, reluctantly obeys the order until one night when he rushes back to his YMCA dorm—and suddenly has an epiphany that stops him in his tracks. In the midst of the trendy Koreatown club scene, an unexpected reunion occurs between childhood friends Penelope and Chester. While quick to judge one another regarding their choices in life, both characters find themselves driven by values common to the Korean American experience, having to navigate the rift between duty and desire. I Want the Wide American Earth tells the story of Asian and Pacific islanders in America through a series of 30 evocative banners accompanied by a selection of artifacts chosen from the collections of the Japanese American National Museum and the Riverside Metropolitan Museum. I Want the Wide American Earth runs from September 14 to October 27, 2013. SAVE THE DATE! Marvels & Monsters opens October 12! 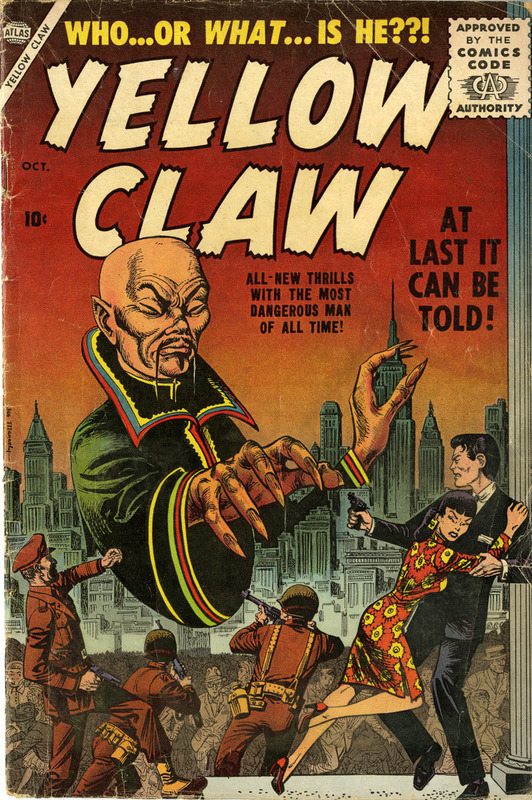 Yellow Claw #1 (Atlas Comics, 1956) Credit: Yellow Claw #1 (October 1956), Marjean Magazine Corp. [Atlas]. With Comic-Con long over and summer superhero movie season coming to an end, are you looking for another pop culture fix? If so, search no more—Marvels & Monsters: Unmasking Asian Images in U.S. Comics, 1942-1986 opens October 12, 2013 at JANM! Through a selection of images from comic books representing four turbulent decades, Marvels & Monsters: Unmasking Asian Images in U.S. Comics, 1942-1986 assembles a team of xenophobic archetypes to illustrate the roots of Asian misrepresentation in pop culture. Curated by Jeff Yang, Marvels & Monsters places these genre-spanning archetypes—the Guru, the Brain, the Temptress, the Manipulator, the Alien, the Kamikaze, the Brute, and the Lotus Blossom—into a historical framework and then follows up with a discourse between current Asian American creators. View the most striking examples of these archetypes alongside contemporary Asian American graphic novels and interactive installations through February 9, 2014. This exhibition is a collaboration between the A/P/A Institute at NYU and the NYU Fales Library & Special Collections. Don’t miss out on two FREE events to mark the opening of Marvels & Monsters! Join us for a special preview of Marvels & Monsters: Unmasking Asian Images in U.S. Comics with curator Jeff Yang. Hosted by the JANM Young Professionals Network. Target FREE Family Saturdays: Zap! Pow! Bam! Celebrate the opening of Marvels & Monsters at our comics-themed Target Day. Check janm.org/target for the schedule. Lela Lee, author and artist of the comic book series Angry Little Girls will discuss her comics and their impact on Asian Americans and beyond. There will be an exclusive, members-only Meet & Greet with Lela at 1PM—stay tuned for details! So many artifacts to choose from! One of our upcoming exhibitions, I Want the Wide American Earth: An Asian Pacific American Story, takes a sweeping look at how Asian Pacific Americans have shaped and been shaped by the course of our nation’s history through 30 banners of poignant text, photographs, and art. To put a personal touch from JANM on the Smithsonian traveling exhibition, we chose to complement the banners with some items from the Museum’s extensive collections. Since we have over 60,000 unique artifacts, documents, and photos in our permanent collection, it was a tough choice! As a summer intern, I was given the (amazing!) opportunity to select these artifacts. There were several qualifiers—the artifacts would have to be both relevant to its banner’s content and interesting, whether visually or content-wise. My first step was to read through the exhibition text to get a better sense of the exhibition as a whole, then to list them out along with a brief summary and relevant information (keywords, dates, people, etc.—anything that might help narrow down artifacts). 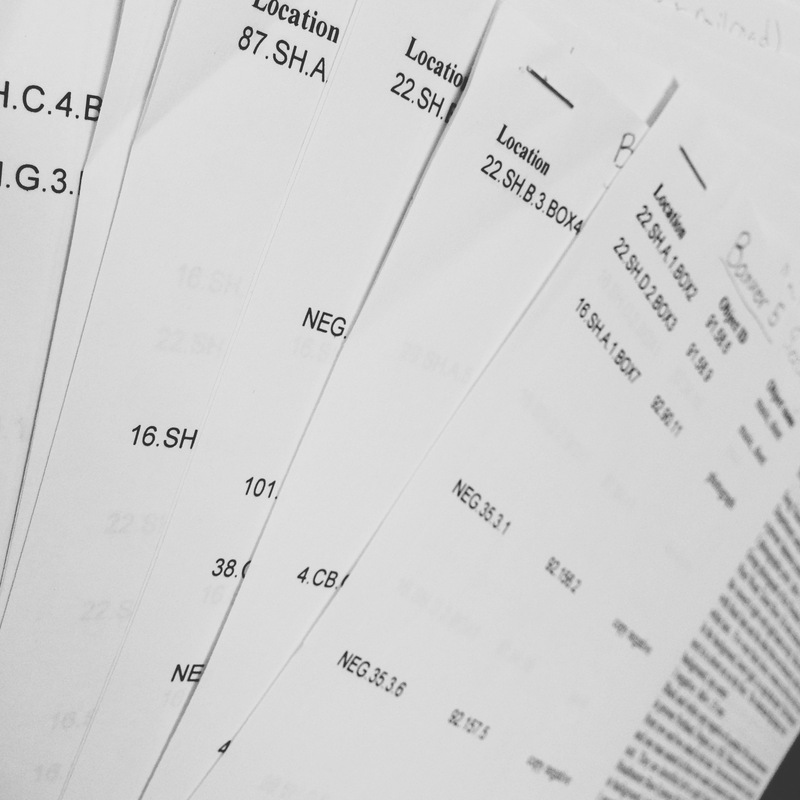 I sent the document to our Collections Associate, who searched the collections database and returned a pretty extensive list of potential artifacts. From there, it was a matter of selecting one or two for each banner and then pulling them to take a look. We also collaborated with the Riverside Metropolitan Museum to loan a few items from their historic Chinatown collections. I don’t want to give away too much (you’ll have to come to the show to see all of the artifacts), but you’ll be able to see a really striking article written in the 1940s by the chairman of the California Joint Immigration Committee. The article, after being submitted to a national magazine, was passed around by the Japanese American Citizens League’s Equality Committee as a reminder of the challenges faced. What I find interesting about the article is the blatantly offensive language—featuring lines such as “Because of their unassimilability and the impossibility of competing with them due to their low standards of living, Japanese immigrants have never really been welcome in the United States.” Of course I was previously aware of such anti-Japanese sentiment (how could I not, after touring Common Ground: The Heart of Community), but seeing it literally spelled out for me made an abstract concept truly hit home. See this artifact and more in I Want the Wide American Earth from September 14 ‐ October 27, 2013! Check the exhibition page for more details. One of our special visitors. She’s been coming to JANM events for over seven years! Wow! 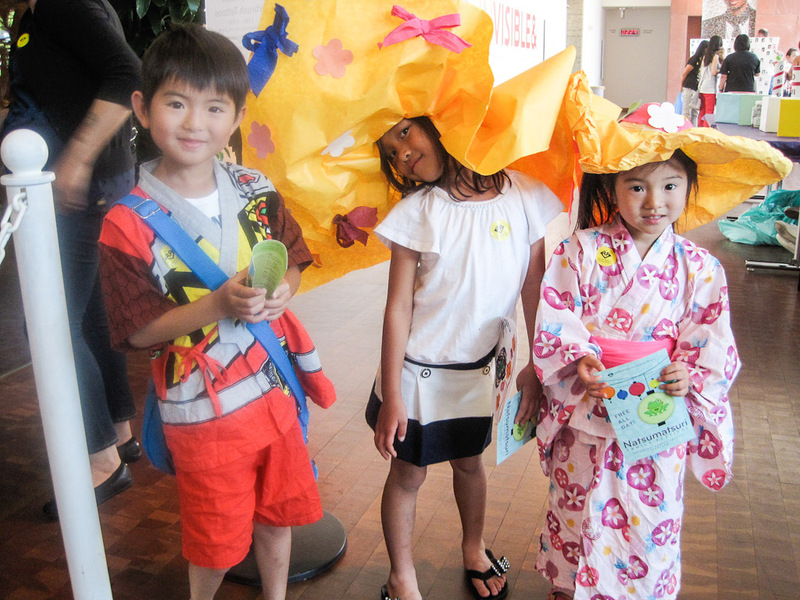 We had such an incredible time at this year’s Natsumatsuri Family Festival on August 10, 2013. Nearly 4,000 guests came to enjoy a day full of cultural performances, demonstrations, activities, and crafts. A big thank you to everyone who made it out (and extra kudos to those who came from as far away as Bakersfield and Frazier Park—that’s a whole lot of driving!). 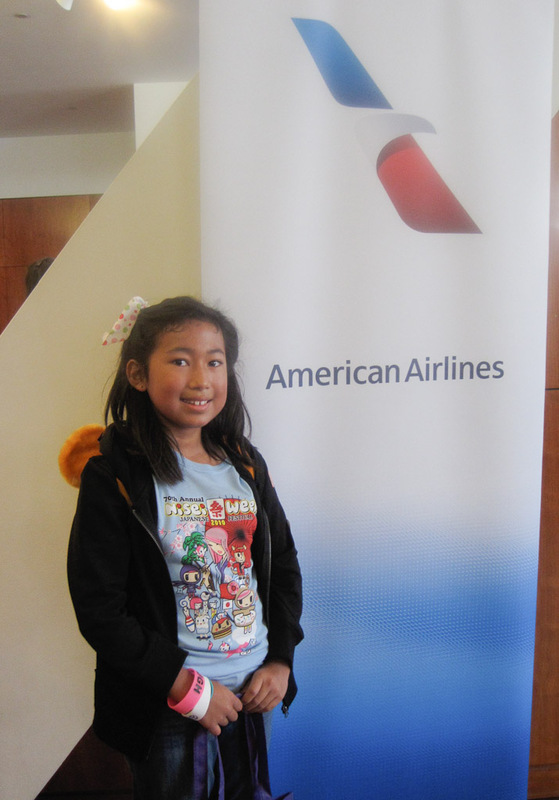 Take a look through this event recap and see if you can spot yourself! Screenprinting kaeru origami and taiko totes! This year, we added a few new perks to thank our Members and Courtyard Kids. 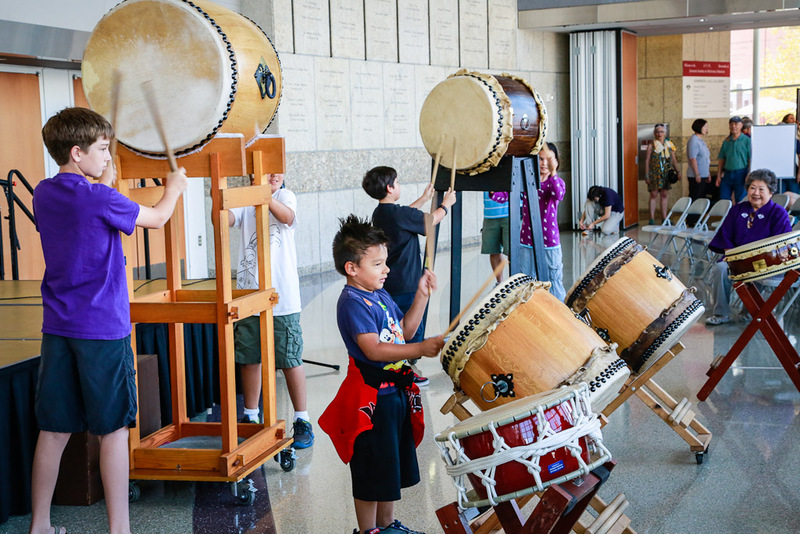 Museum members were able to use special “fast pass” lines for some of our most popular activities, including the yukata dress-up and the screenprinted tote bags. Members also got prime seats at our Aratani Central Hall performances and demonstrations. To all of our members who came out for Natsumatsuri, thanks again for your support! Japanese mariachi Roger del Norte, performs for the crowd. Speaking of Central Hall events, we had a day jam-packed with great performances! 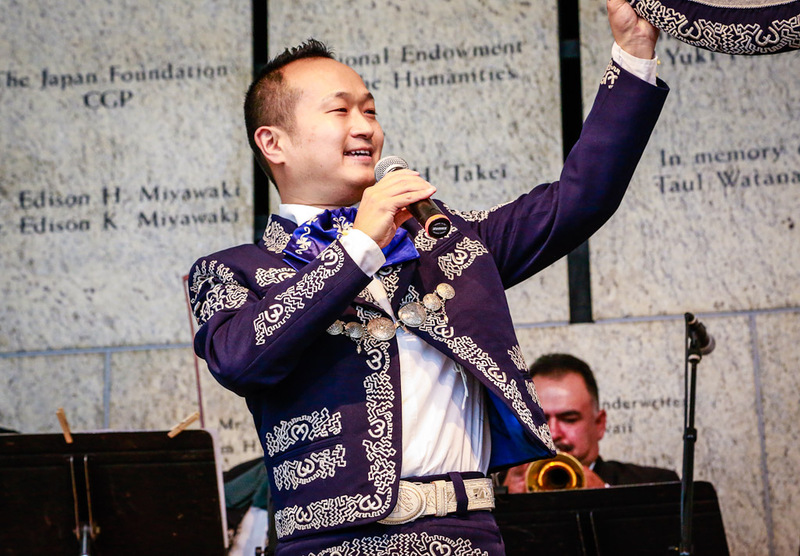 Roger del Norte and Lupita Infante stole the show with a Japanese-Spanish mariachi duet, accompanied by the band MEXICAPAN. It was standing room only for Roger and Lupita, and the crowds didn’t let up for the L.A. Matsuri Taiko performance that finished up the day. JANM President/CEO G.W. Kimura with the visiting courts. Long before that, we kicked the day off with a visit from the Nikkei courts of San Francisco, Honolulu, and Seattle. 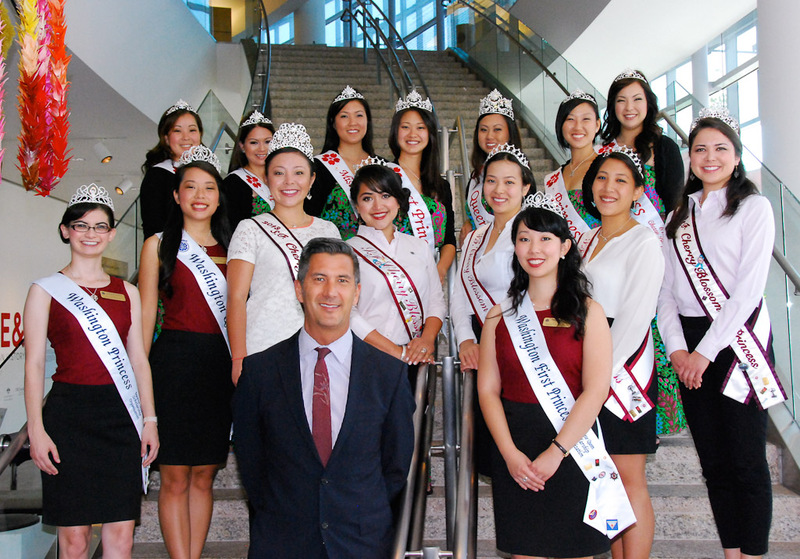 The queens and princesses came by for a meet n’ greet with JANM President/CEO G.W. 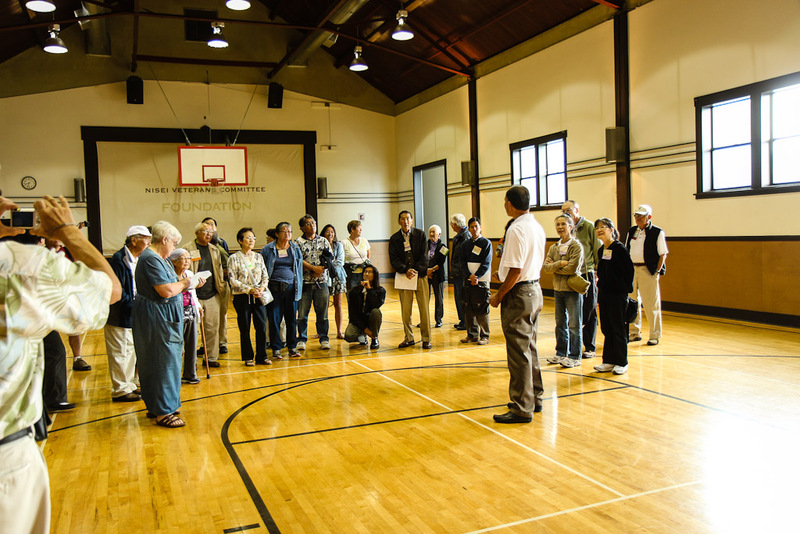 Kimura, followed by a tour of our Common Ground: The Heart of Community exhibition from our knowledgeable docents. 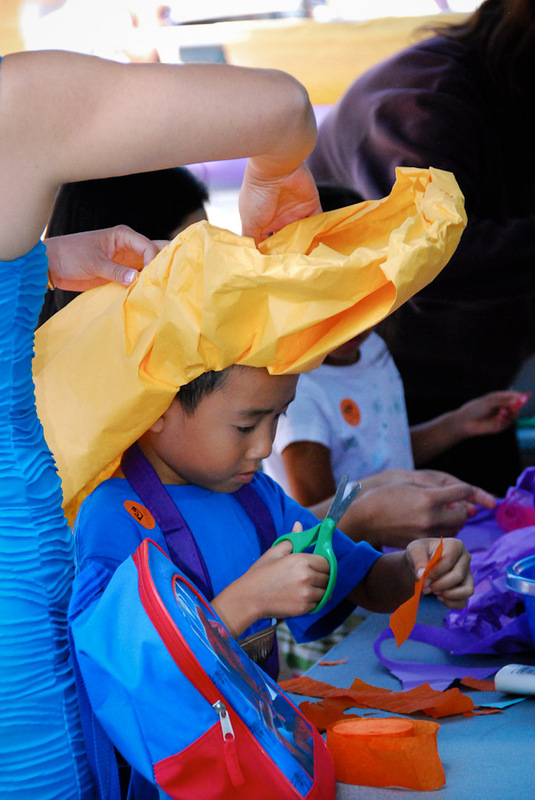 A visitor and his mom work on their wacky paper hat. What’s your fortune? One visitor is about to find out! We’re big believers in interactive activities fun at JANM. This year, we invited visitors to make self-portraits and fans upstairs, while we once again hosted the “What Are You?” photo activity and omikuji fortunetelling downstairs. Traditional Obon dancing lessons and airbrush tattoos were also big hits. What was your favorite part of the day? See below for more photos! Some nifty tote bags are shown off by their satisfied owners. Three guests show off their Natsumatsuri decorated fans! Rev. Bill Briones prepares for his talk on Obon traditions. Kip Fulbeck photographs visitors for his identity activity. What are you? Visitors answer the question on their photos. Free airbrush tattoos are always a big hit with the younger set. Everyone’s self-portraits get classy with our fancy frames! Our volunteers staff the hopping paper frog table to teach visitors. Honolulu’s princesses and queen take a tour of Common Ground. Learn to dance the night away at our group dance lessons! One of our Courtyard Kids finds her name outside the Museum! JANM volunteer Ruthie Kitagawa shows off a hopping paper frog. Mariachi singer Lupita Infante performs with Roger del Norte. It’s standing room only for the L.A. Matsuri taiko performance! Thanks to our wonderful volunteer photographers for documenting the day: Russell Kitagawa, Nobuyuki Okada, Richard Watanabe, Tsuneo Takasugi, Shoji Tokumasa, Richard Murakami, June Aoki, Caroline Jung, and Daryl Kobayashi. 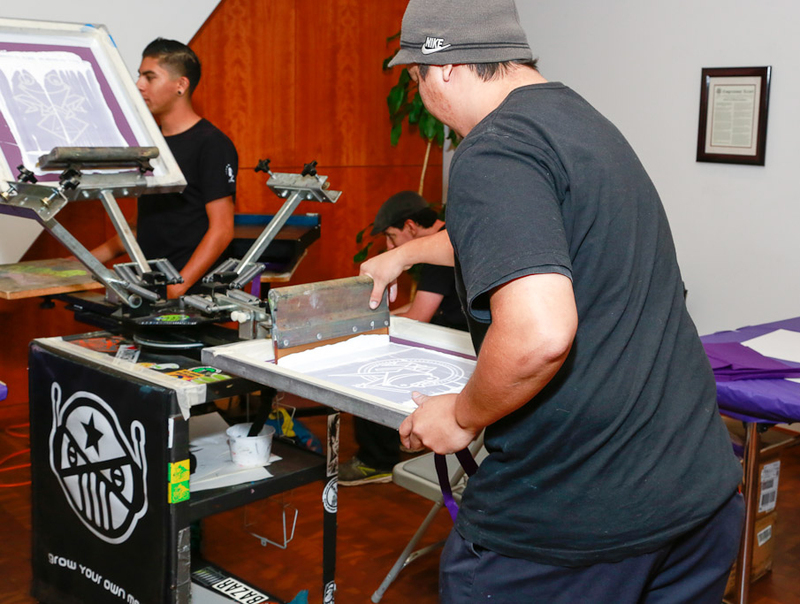 Interested in an afternoon spent learning with a fantastic Los Angeles contemporary artist? Join us on Saturday, August 24, at 2:00pm (free with Museum admission) to see the world of Shizu Saldamando through her own eyes with an artist talk and portrait workshop. Shizu is known for her unique portraits that draw inspiration from her Asian and Mexican heritage. 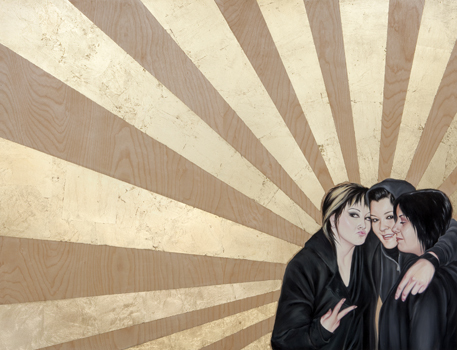 During the talk, Shizu will discuss her series Stay Gold, currently hanging as part of the Portraiture Now: Asian American Portraits of Encounter exhibition on view at JANM through September 22, 2013. Her drawings and paintings begin as snapshots taken with a cheap point-and-shoot and are then stripped of context and redrawn. Through portraits of her often-unsuspecting friends—taken at parties and informal gatherings—Shizu gives the viewer an insider’s glimpse into a youthful world of freedom and shifting, malleable identity. In addition to her contribution to Portraiture Now, Shizu has recently worked on Art Intersections: Asian-Latino Pop-Up Museum, hosted by the Smithsonian in downtown Silver Springs, MD. As a curator for the second day of the pop-up—working alongside Eric Nakamura of Giant Robot (another familiar face at JANM)—Shizu projected artwork representing the Asian-Latino connection onto public surfaces. Learn more about Shizu in this KCET article and video.